Nanibaa Beck (Diné) was exposed to contemporary Native American art and practice at an early age. After 20+ years of assisting her father, Victor Beck, Sr., a master Navajo silversmith, Nanibaa created her jewelry line NOTABOVE in 2013. Her earlier research work and museum fellowships included the National Museum of American Indian and the Peabody Essex Museum. Originally from Pinon, Arizona, Nanibaa currently resides in North Carolina. Nanibaa watched the young Diné woman approach her jewelry table at the Heard Museum Market. When Diana Onko tried on the necklace with a black abalone stone, the connection was immediate. The two women had an unspoken language forming between them, words and emotions woven into the necklace Nanibaa began six months prior as part of healing from her mother’s passing. When Nanibaa learned Diana’s mother had passed and that her favorite stone had been black abalone, she made sure Diana was able to purchase the necklace. While Nanibaa’s father taught her the art of metalsmithing, her mother redefined love. Nanibaa working on her jewelry. Nanibaa carries on that love through her Language Collection. The Diné word for writing means “tracing the line.” As a jewelry maker, she takes time to create each piece by hand using a mini saw blade to trace and cut out lines. Nanibaa carried her mother’s love into a space where she elevated her skill with an 8-week concentration class at Penland School of Crafts. 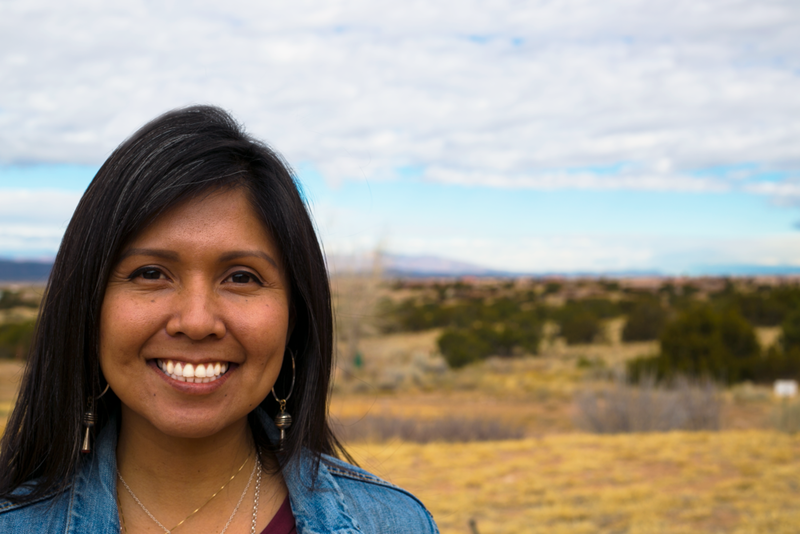 She carries her mother’s love into the fellowships she was blessed with this year—First Peoples Fund Artist in Business Leadership and Artist in Residence at the School for Advanced Research, both of which propelled her forward in formal education and equipment. Nanibaa’s experiences in the fellowships helped her focus on creating around blossoms for her Bloom Collection: #Iambloomingfrommymothersprayers.